I love presents, surprise parcels and handmade things, so this is going to be swell! While spending some time blog-hopping, I ended up at Blue-J Cottage. This is a blog written by a lady who loves cats and sewing, like me. Only she's a lot better at sewing! She also wrote a post about the Pay It Forward Handmade movement. It sounded like a fun thing to do, so I decided to participate. The concept is easy. 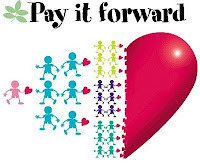 If you find a Pay It Forward post, AND you blog, too, AND you are one of the first three commenters on the blog post that tells you about Pay It Forward, this blog owner will make something especially for you. I am very excited about this idea and wondering what Ms Blue-J Cottage is going to make for me! 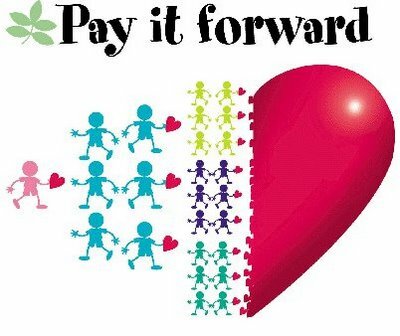 Are you interested in joining Pay It Forward Handmade? 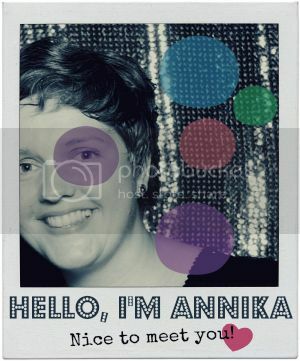 Ideally, this will help all of us to get to know some fellow bloggers and to spread some handmade joy and cheer around. I sure am looking forward to reading my first 3 commenters' blogs and to deciding what to make you! Yay! I have now found three people to craft for, so I closed the comments.